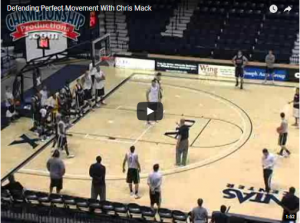 This post contains three videos from Xavier practice with Head Basketball Coach Chris Mack (now at Louisville). The first video is a 5 on 5 defensive drill requiring the defense to play perfectly for 24 seconds. The second video, triangle rebounding drill, emphasizes taking the rebound aggressively. The final video is a two player drill working on help position and closeouts. Press the play arrow in the middle of each video to see each You Tube video. Make sure that your sound is on as you watch them. This basketball drill requires players to be in perfect position, communicating with teammates, seeing the basketball, and staying in their defensive stance for 24 seconds. Any breakdowns, and the players must start the drill again for a full, consecutive 24 seconds. You can add any fundamentals that you want to the requirements or require that players execute for a longer period of time to win the drill. Make sure that your sound is on and click the play arrow to see the video. Coach Mack defines a rebounding role for each player as “Hit and Seal” or “Hit and Get” (Go after the basketball). In addition to blockouts, he emphasizes taking “loud” rebounds. Make sure that your sound is on and click the play arrow to see the video. Drill to work on getting in the defensive gap to see both the basketball and the player you are guarding, establishing help side position, and closing out. Make sure that your sound is on and click the play arrow to see the video.